My mom never accepts presents gracefully. Her usual modus operandi is to wait about a week after she has gotten something and then return it to the giver, saying "Oh, I would never use this." Or "You need it more than I do." Or, in the rare instance, "Do you mind if I give this to Hazel? I don't need it and she might like it." Finally, one day, about six weeks ago, I snapped. I told her that it wasn't very nice to always give presents back, that it made the givers feel like crap and that she needed to just say thank you and never mention what she did with the gifts ever again. She made little wounded noises and "Well, I was just trying to be nice" statements and was generally kind of miffy. Since then, there have been a couple "Oh, I was going to try to give this back to you but I'm not allowed," statements, but she has been better, admittedly. But I should have known she had a card in her pocket. A couple weeks ago, she finally cancelled the WebTV service that my sibs and I had bought for Mom and Dad in, oh, 1997. She was mostly getting spam email and wasn't enjoying it and it wasn't worth the $24.95 a month she was paying MSNBC for it. "I don't know what to do with that keyboard thing," she said. "Throw it away, donate it to Goodwill, whatever," I said. "Well," she replied. "I know I'm not allowed to get rid of anything you give me." Twelve years, people. She has had it for at least twelve years. HA! Touché, Mom! YOU WIN AT PASSIVE-AGGRESSIVENESS. And I wonder where I get it from. I was ready to get laid off when I dressed for work this morning. I just felt it would be today. My office's dress code is very casual, but something inside me said "I am not going to look like a schlub in front of these human resources people." So I put on my best slacks and a colorful top and makeup and accessorized appropriately, just in case. And I was right - by 9:30, I had gotten the speech ("the economy, necessary streamlining of operations blah blah blah") and the big green folder of paperwork and had to make the Walk of Shame across CubicleLand. 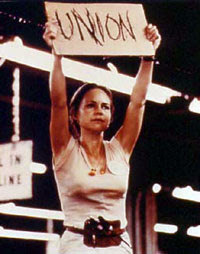 I almost wanted to write "UNION" on my notepad and hold it above my head just for fun, a la Norma Rae. When this journey toward layoffs started, I was scared to bring anyone along with me, but now that I have officially gotten notice, I am so glad I was honest here on my blog. The support and warmth of people on the internet is incredible. It makes me feel like I am part of some magical community. Of course, I don't know how magical it will feel when, sometime in the spring, I show up on y'alls front porch, asking for lunch and then have you tell me to get lost or else you are calling the police, but still...for now, it feels great. And then there's my family and local friends. Also lump-in-the-throat great. Nothing like adversity to make those bonds clear. And to tell you the truth (slap me if I begin another paragraph with "and") it wasn't all that adverse. As I said in the post previous, my team was decimated. Out of five in California, two are left. But we took it with grace and humor and a good bit of joy. We made the human resources layoff lady cry. Twice. And this is a woman who lays people off ALL DAY LONG. She cried because we were so great and because we comforted our boss instead of asking to be comforted. Because we laughed and joked and looked each other in the eyes. We were released for the day but we didn't want to leave. We had a potluck planned for lunch, so we hung out and bitched and laughed and then ate a long, slow, delicious lunch topped off honest-to-God Snickers Salad. 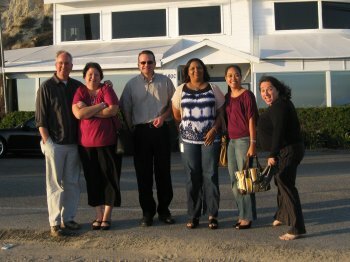 I will indeed miss the people I worked with. They were truly the finest kind and we made an awesome, work-doing machine. That our efforts were not good enough for the company we worked for speaks more to the impatience and cruelty of modern corporate life than to anything we did or didn't do. All things come to an end, and it was time for an ending. Time for me to bust out and to move on. I have no idea what I will be doing, but I have no doubt that my life will be more creative, more zany, and more fun-filled than it was before. With quite possibly a good dose of struggle and angst thrown in for good measure. Of one thing you can be sure: I will keep you posted. My rollercoaster is yours. Thanks again for your kind words, hopes and prayers. You're the best. 30 days notice, decent severance package, our team decimated. More deets later. I'm ok.
Matt, Rachel and I were walking to lunch. "Holy sh*t!! What is that...."
"Oh my gah. Are there DEAD PEOPLE in there or something?" We began staggering around, clutching our noses in a dramatic fashion. We had walked by a parked tractor-trailer truck that a horrible rotten fish smell was blowing up from in giant green clouds. Well, not literally, but still. "Something is seriously wrong with that," I said. "Who leaves a trailer full of rotten fish?" When we came back from lunch, the reeking thing was still there, and though we cut across the parking lot and walked far away, it the stinky stank still smashed into us. "I'm gonna call the police and tell them," I said. So a couple hours later, I made the call. "I'm over on Reese Road and there is this truck that is full of rotting fish," I said. "Is it parked illegally?" the dispatcher asked. "Do you think for some reason that it is stolen?" she said. "Ah, no, but it seems weird," I said. "It really stinks." "So you are reporting what, exactly?" she asked. This is when I saw the flaw in my theory and saw this call through the dispatcher's eyes. I'm sure her flashing "NUTSO" sign was blinking like mad. "Uh, um, I guess I know that parking a stinky truck isn't exactly illegal," I said, "But I think maybe it is abandoned or something. Can you just send someone to check it out?" "Right. Ok," she said patiently, with the tone of someone who is going to turn around to her co-worker right after this call is over and relay this dumbass conversation word for word. "If someone is in the area, I will have them stop and take a look." Then she took my name and phone number. No one came to get me and take me away, so I guess that's something. There's that old notion that men who drive huuuuuge monster trucks must be compensating for a lack *ahem* somewhere else in their lives, right? The guys at work want to know - does that make women a little more interested in guys who drive Mini Coopers or SmartCars? The latest rumor flying around - and who knows if it is true - is that layoffs will be conducted in a staged fashion, a bunch every so often 'til the end of the year. Or maybe longer. Yes! This is SO good for my mental health. I am SO GOOD at handling this kind of stress. Almost as good as I am at riding a unicycle on a tightrope while juggling flaming Barbie dolls! Please send Xanax. Or Oxycontin. At this point, I have no room to be picky. *I am joking about sending me drugs. Please do not break any local, state or federal laws on my behalf. Belgian Waffling wrote a post the other day about trying to memorialize her mother's death properly and feeling like she failed to do so. I can't ever find a meaningful way to mark these occasions. I've lit candles, many many candles. My mother was always finding a church wherever she was (despite being an exceptionally lapsed Catholic) and lighting a candle for some or other person she was worried about. We went the morning after she died and lit candles in York Minster and though the gesture was absolutely right, one she would have absolutely done herself, it was hollow for me. Everything I've tried feels empty. I've sat in the undertakers with my sister and a Diptyque candle, and a coffin, neither of us quite sure what we thought we were doing, I've been to a tree planting, I've been for ceremonial afternoon tea at Bettys Tea Room...But I can't find a single thing to do on these days that feels right for me. I suppose I still think there's nothing right about her dying; a decorous, fitting tribute feels inappropriate. It suggests a finality I don't feel. I suppose anyone who has been through a big loss knows what she is talking about - "Everything I've tried feels empty. Sigh. Today is Dia de los Muertos, a joyous Mexican celebration of those who have passed on before. Family and relationships are tremendously important in Mexico. Of course, they are important everywhere, but Mexicans seem to have a strong and special warmth for family that they extend far past death, recognizing that just because people's bodies are no longer with us, that doesn't mean that those people aren't still in our lives. As I prepare for the holiday, which we celebrate at church, I have of course been thinking of Laura and Curt. They knew each other well and had great affection for each other. I hope that wherever they are, that their paths cross frequently. The thought of them hanging out together gives me great comfort. So in honor of Dia de los Muertos, let me share a little Curt and Laura story. The house I lived in with Curt had a terrible ant problem. While this worried me a bit, it sent Curt into a frenzy. He tried to stop the ants with every non-toxic method known to man. He put the cats' food dishes into little moats of water. He sprinkled boric acid on ant trails. He used Windex and Simple Green. And still the ants came. One time when Laura was visiting, she saw Curt on his ant hunt. He had been sticking his head in the back of the cabinets with a flashlight, hunting ants. A week after she went home, a package arrived in the mail for Curt. It was a big bag full of plastic glow-in-the-dark ants. The note said "I thought these would be easier for you to find with your flashlight." That's the kind of person my sister was. Always thinking of other people. Edited to add: 10 seconds after I published this post, I walked into the kitchen to find one of my cabinets infested with ants, which had never been a problem here before. Ok, you pranksters. I get the picture. Knock it off! Love you two. 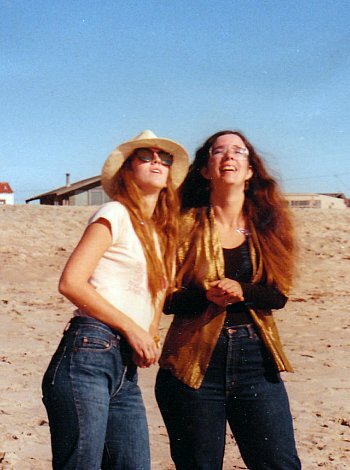 Me & Laura on the beach in 1983.